Containing a unique blend of natural phytoceramides, essential vitamins and antioxidants, these ceramide capsules have been specifically created to restore skin from within and boost collagen. POTENT BEAUTY BLEND: Containing a unique blend of natural phytoceramides, essential vitamins and antioxidants, these ceramide capsules have been specifically created to restore skin from within and boost collagen. REDUCES AGING: Acting as a potent dermal repair complex, this powerful skin supplement promotes increased hydration and skin cell renewal to create a younger-looking, smoother complexion. HELPS ELIMINATE WRINKLES: From fine lines to crow’s feet, these capsules contain effective skin vitamins for women specifically designed to smooth-out the appearance of multiple types of wrinkles. REPAIRS SUN DAMAGE: Sun damage instantly creates an aged look. But, due to the powerful skin care vitamins in this aging skin supplement, repairing harmful sun damage will be aided to create a youthful, radiant look. Follow these guidelines for best results: 1. Take one (1) capsule once a day 2. Best consumed 20-30 minutes before your meal 3. 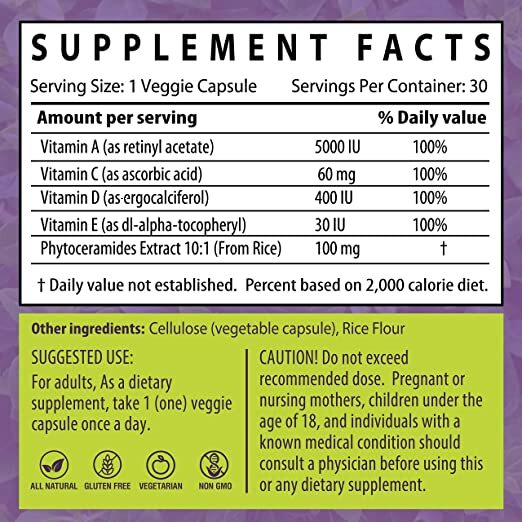 Take with 8oz of water or as indicated by your healthcare professional. Remember: Don't exceed the recommended daily dose of one (1) capsule. This supplement is potent. Each serving of Phytoceramides contains: Phytoceramides (from Rice) - (providing Glycolipids, Phytoceramides & Glycosylcerimides) 100mg, Vitamin A (as Retinyl Acetate) 5000 IU, Vitamin C (as Ascorbic Acid) 60mg, Vitamin D (as Ergocalciferol) 400 IU, Vitamin E (as Di-Alpha-Tocopheryl) 30 IU, Also contains: Vegetable Cellulose (Veggie Cap), Purified Water, Magnesium Stearate, Stearic Acid, Silicon Dioxide.